Entered October 2017; revised August 2018. Sale, New York, Sotheby’s, May 18, 2006, lot 123: “Property of a Private Collector . . . 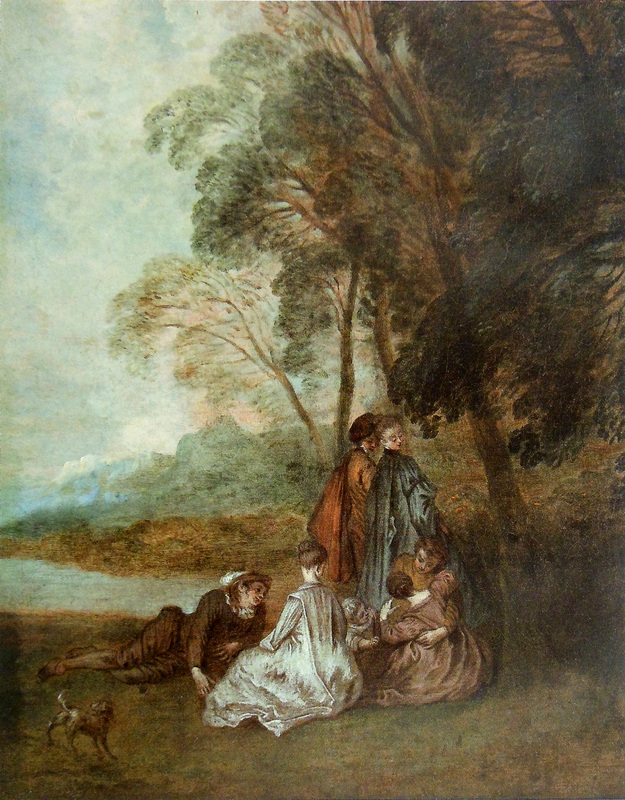 ATTRIBUTED TO JEAN ANTOINE WATTEAU . . . FÊTE CHAMPÊTRE / oil on canvas / 15 by 11 ¾ in. ; 38 x 29.8 cm. / $20,000-30,000 / £11,600-17,400 / €16,600-24,900.” Sold for $18,000 plus premium. Unidentified artist, Fête champêtre (detail). 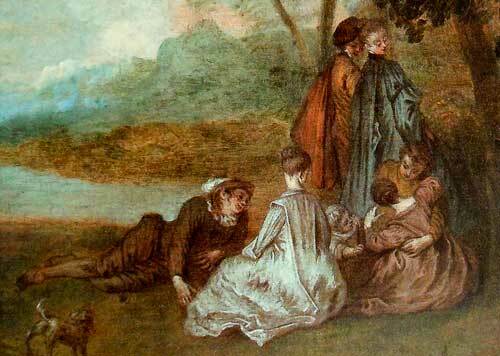 Watteau, Les Plaisirs d’amour (detail). Dresden, Gemäldegalerie. The major source of inspiration for this painting is Watteau’s celebrated Les Plaisirs d’amour, now in the Dresden Gemäldegalerie. The figures at the right—the strolling couple and the man helping the seated woman rise—imitate Watteau’s design in most aspects, including not only the poses and the direction of the composition, but also the colors of the costumes. This suggests that the pasticheur either knew Les Plaisirs d’amour firsthand or had access to a color photograph. 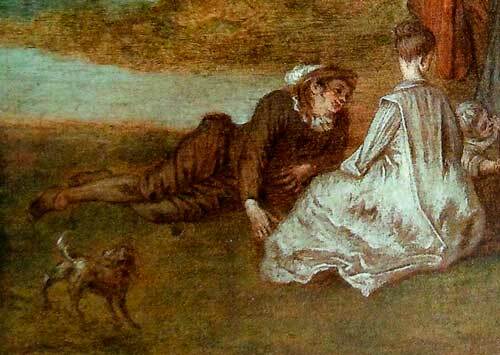 Anonymous copy after Watteau, Entretiens amoureux (detail). Whereabouts unknown. The two figures at the left side—the seated woman in a white gown and the young man reclining on the ground—are analogous to their counterparts in Les Plaisirs d’amour in terms of their poses. 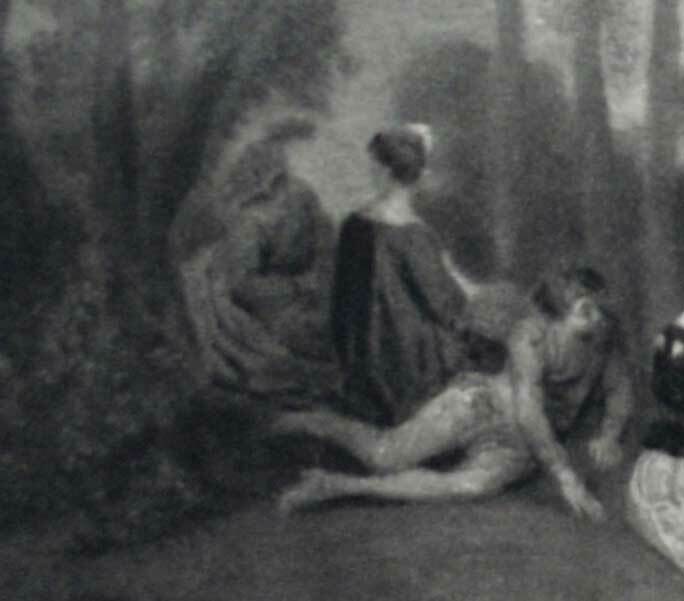 But, in fact, they were apparently derived from a different Watteau composition, Entretiens amoureux, a work known through several copies, such as the one that was in the Jules Strauss collection. In Entretiens amoureux the woman and man are seated back to back but in the pastiche their positions are reversed. Additionally, the pasticheur took the feathered cap from the man farthest back and gave it to the reclining man. He also borrowed the attentive dog from Entretiens amoureux and added it to the left corner of his fête galante. Although the trees might seem to have been painted in the manner of Watteau, the dense clump of foliage at the right menaces the woman who approaches it, and the view of the lake and open space at the left side is too expansive. It does not accord with the master’s landscapes. This work is painted loosely, as though it were a preliminary study for a more finished picture. This is a ploy used by copyists to explain away the deficiencies that might result from a comparison with Watteau’s established oeuvre. 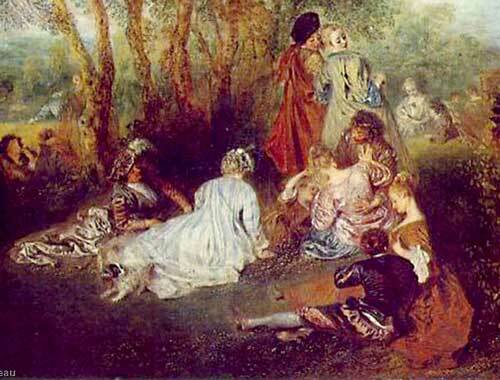 However, it should be remembered that Watteau did not execute painted modelli for his pictures.